The overall design of the Reeven Justice RC-1204 falls into the conventional category. You will not find any radical design differences on the product. The shape of the fins is roughly rectangular, which makes the heatsink practically a prism. To secure the fan to the heatsink, the fins are carefully designed for the four plastic clips. As you can see from the picture, a little notch on one side of the fins' corner is designed to hook the fan installation clip, while the other side of the corner is shaped to hold the fan in position. As long as the fan is in the right position, the fins ensure the fan is secured. After the fan is installed, a gap can be noticed between the fan’s air outlet side and the heatsink. The leading edges of the fin are generally pretty straight on the Reeven Justice RC-1204. If you observe it carefully, you will notice the left and right edges of the fin come slightly inward at the middle section. The practical reasons behind this edge design has to do with aerodynamics. Not all the fins are the same on the Reeven Justice RC-1204. The fin on the top is thicker than others. There are two reasons. First, the top fin should be protective to other fins below. Second, thicker fins make the whole cooler stronger. The thicker top fin means the cooler is sturdily built. The Reeven logo is engraved in the middle of the top fin. Two holes are located at the left and right sides of the Reeven logo. They are designed to allow the long-reach screwdriver to go through when installing the baseplate mounting bar. The baseplate mounting bar has notches that allow us to precisely locate it on top of the base plate. We can see the design team of the Reeven Justice RC-1204 has put in a lot of effort to deliver a sophisticated top view of the cooler. The stylish top fin definitely elevates the appearance of this product. There are six continuous heatpipes on the Justice RC-1204, while only four heads are coming out of the top fin. When it comes to measurements, the Reeven Justice RC-1204 is 131mm in width, 162mm in height, and 105mm in depth including the fan. It is not a huge CPU cooler, but definitely not small either. From the above picture, you can tell how big or small the heatsink is compared with a standard 120mm fan. Due to the relatively smaller size, the overall weight of the Justice RC-1204 is 930g, which is expected. Lightweightness is a welcome feature for a CPU cooler, since it will cause less stress on the motherboard. However, the only concern about the small size is the reduced surface area of the fins, as it has a negative effect on cooling performance. For an air cooler, whether it is for a combustion engine or for an electronic device, the trade-off between size and cooling performance must always be considered. We will have to see how the cooler's size and fan complement one another on the next page. In the above photo, since the cooler is laid on the table instead of standing, the top fin is now on the left-hand side. As I have mentioned earlier, there are two kinds of fins on the Justice RC-1204. The top one is the thickest for better protection of the fins below. The rest of the fins are thinner to save weight. The fins are made out of aluminum, not copper. It is true that the thermal conductivity of copper, which is 401W/mK, beats the thermal conductivity of aluminum, which is rated at 237W/mK. However, using copper for the whole heatsink may not be a good idea. This is because the density of copper is much higher than that of aluminum. Think about it -- for the same volume of metal, copper is more than three times as heavy as aluminum. 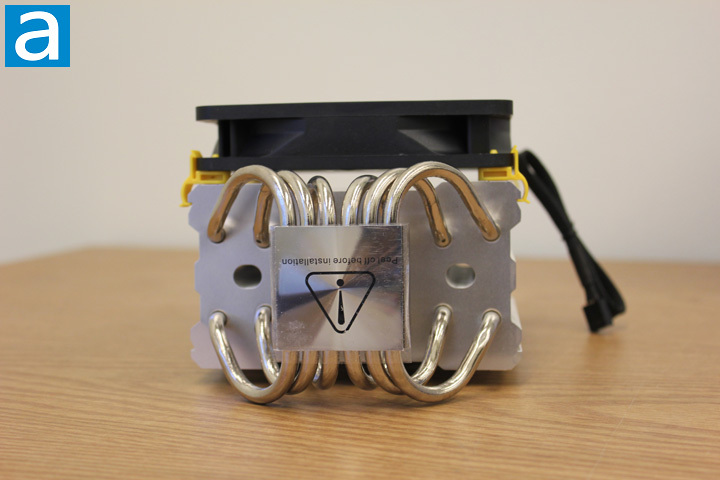 If you make an all copper heatsink using the same size and shape of the Justice RC-1204, the heat dissipating performance may be improved by less than 50%, while the weight is 300% more. It is simply not a good deal. The material and surface area of a CPU cooler are not the only factors in determining cooling performance. The fan, which is responsible for speeding up the air ventilation, plays another key role. 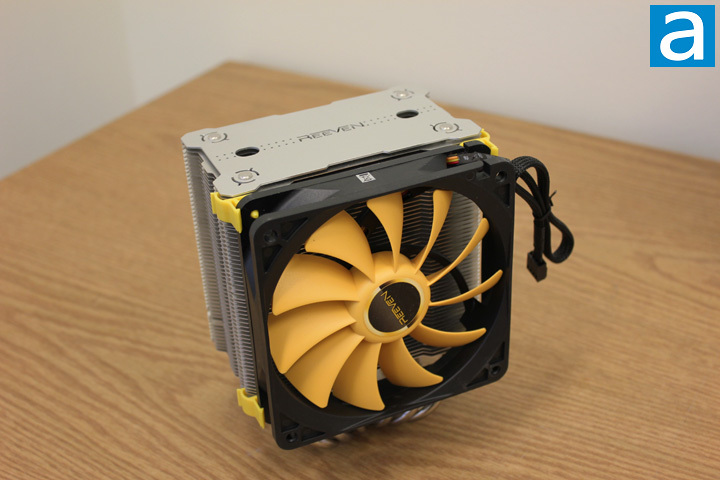 For the Justice RC-1204, the 12025 PWM fan from Reeven takes the fan position on the heatsink. As its name implies, the 12025 PWM fan has adjustable RPM through pulse width modulation. The adjustable spinning speed of a PWM fan allows a lower noise level when the cooling duty is not heavy. On the other hand, PWM can also push the fan to higher RPM whenever it is necessary. The maximum air flow of the 12025 PWM is 82.1CFM, and the maximum air pressure is 0.067mmH2O. Note, CFM stands for cubic feet per minute. I would not say the stock fan of the Justice RC-1204 has impressive specifications on paper. How about its real life performance? Only tests can help us find out, which we will detail on the next page. Regarding the noise level, thanks to the use of a sleeve bearing, it is specified as 29.8dBA at the loudest, which I think is not bad. Regarding the RAM clearance, enough space is left thanks to the slim structure design. Generally speaking, for the Justice RC-1204, there is no need to worry about the clearance between the heatsink and the motherboard. Let us move on to take a look at the base of the Reeven Justice RC-1204. Reeven made this base out of copper. If you are not seeing the right color of copper on the plate, please do not doubt the quality of the photo. This is just because the base, as well as the heatpipes, of the Justice RC-1204 are electroplated with nickel to protect them from oxidation. Keep in mind that nickel is highly resistant to corrosion, therefore it can keep the copper parts of this cooler in their optimal condition for a long time. The other benefit of having a nickel-plated base and heatpipes is to match the color of the fins. The quality of the nickel-plated finish on the base is pretty good. The contacting surface looks just like a mirror after the protection film is removed. 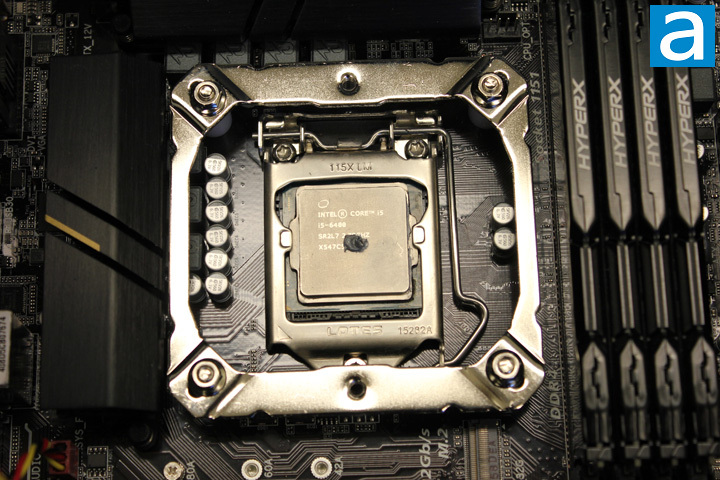 With the help of the provided thermal paste, heat can be smoothly transferred from the CPU to the cooler. All six continuous heatpipes are firmly soldered to the base. Also, the fins which are crucial components for dissipating heat are firmly attached to the heatpipes. Therefore, the whole cooling system is sturdily built, and it allows the Justice RC-1204 to cycle through the evaporation-condensing procedures for years to come. 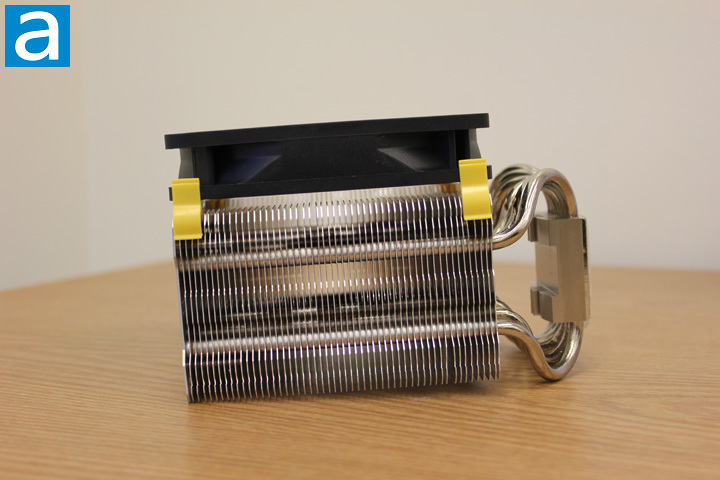 For the Justice RC-1204, the orientation of the heatpipes are perpendicular with the fan mounting surface of the heatsink. This feature makes the alignment of heatpipes different from that of other CPU coolers such as its brother the Reeven Ouranos RC-1401. In this case, the heatpipes are aligned in two rows into the radiator fins, while for the Reeven Ouranos RC-1401, there are six rows. The layout of the heatpipes of the Justice RC-1204 allows the heat to be evenly distributed to the fins. From the above picture, you can see the fan is attached to the heatsink's fins by using yellow plastic clips. The plastic clips look sturdy, however, if I could choose, I would prefer the wire clips, since I believe the wire clips are easy to use and pretty solid. Anyway, as long as it does not take screws to attach the fan, I have no complaints. Installation of the Justice RC-1204 was definitely a pleasant journey for me. Before I put everything in my computer, I took a while to look into the installation manual. The backplate was needed to install the mounting bracket for both Intel and AMD. On top of the mounting bracket, the included bar can be attached using screws. It is worth noting all the essential parts for the heatsink installation are made out of metal. Therefore, they are strong enough to support the CPU cooler. 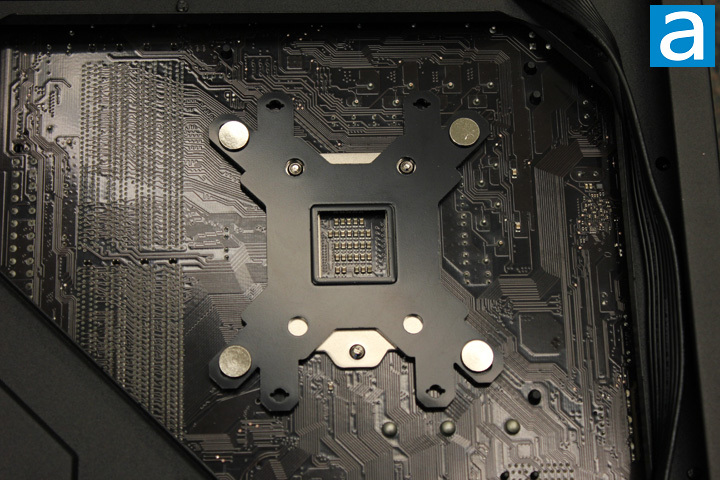 On the other hand, there are also rubber pads at the contact surfaces of the motherboard and mounting system. Users do not need to worry about over tightening screws. The metal backplate of the Justice RC-1204 is painted in black. From the above picture, we can see the backplate merges well into the motherboard and motherboard tray. Of course, it only happens if you have a black motherboard and computer case. After the backplate is in position, the mounting bracket can be screwed on. Similar to the installation of the backplate, there are also three positions to screw the mounting plates. If you are confused by those screw positions, just take a look at the installation manual. In my case, I just used the screw position in the middle, which is for Intel LGA 115X. According to my installation experience, all components fit precisely. Thanks to the slim structural design of the heatsink, none of my RAM was covered by any part of the Justice RC-1204; not even the fan covered anything. This feature allows me to upgrade or troubleshoot my memory without the hassle of removing the fan or CPU cooler. By the way, you do not need to install the fan after the heatsink is mounted, since the screws for mounting the heatsink are not by the fan. You just need a long screwdriver. Generally speaking, the Justice RC-1204 is well designed. The thicker top fin and the heatpipes' arrangement are two welcomed features of this product. Regarding the installation procedure, the Justice RC-1204 delivered a positive installation experience. As for the actual cooling performance, let us turn to the next page and find out.